from Allergic to Death by Peg Cochran. My name is Giovanna Fitzgerald but I go by “Gigi.” My name reflects my heritage—half Italian and half Irish. I have a plaque on my kitchen wall that says “I have an Irish temper and an Italian attitude,” and that just about sums it up! When I discovered my no-good, miserable, conniving husband Ted was cheating on me—with an older woman!—I packed up my things and left New York City behind for Woodstone, Connecticut. Of course there remained the small matter of how to make a living—I’d been an editor at a wedding magazine in the city, a job which didn’t translate to the bucolic countryside of Connecticut. My friend, Sienna, and I brainstormed some ideas and came up with Gigi’s Gourmet De-Lite. I make delicious, but low calorie meals for a select group of clients. I’ve rented the most adorable cottage and made some wonderful new friends—especially Carlo who runs Al Forno, a restaurant in downtown Woodstone. Everything was going swimmingly until one of my clients dropped dead from a peanut allergy, and the police decided to pin it on me. Of course that’s when I met Detective Bill Mertz—the most infuriating, annoying, drop dead gorgeous man I’ve ever come in contact with. Honestly, some days I can’t wait to find out what happens next! I'm looking forward to this new series,too! Great cover--cute dog! Looking forward to this new series! oh yeah, i will be buying this one. Hope you will all enjoy it! Sounds like a good recipe for a terrific series...and I love the cover! Gigi, I can't wait to see some of the reduced calorie gourmet delites that you create for your clients. Be careful around Detective Bill Mertz, though. A lot of cozy characters get into hot water with cops! 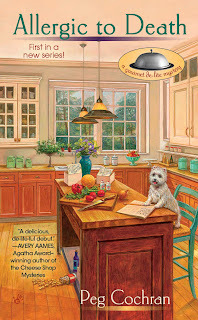 This sounds like a cute cozy mystery! oooh, I want to hear more about this annoying drop dead gorgeous detective. Can't wait to read this one and meet you, Gigi! We have a mutual friend named Peg.